NASA has shared an image of a weird rectangle iceberg that appeared floating off the east coast of the Antarctic Peninsula, near the Larsen C ice shelf. The image was taken during an IceBridge flight—an airborne survey of the planet’s polar ice. The mission aims to provide a 3D view of the ice that makes up the Arctic and Antarctic, providing vital information on how it changes over time. 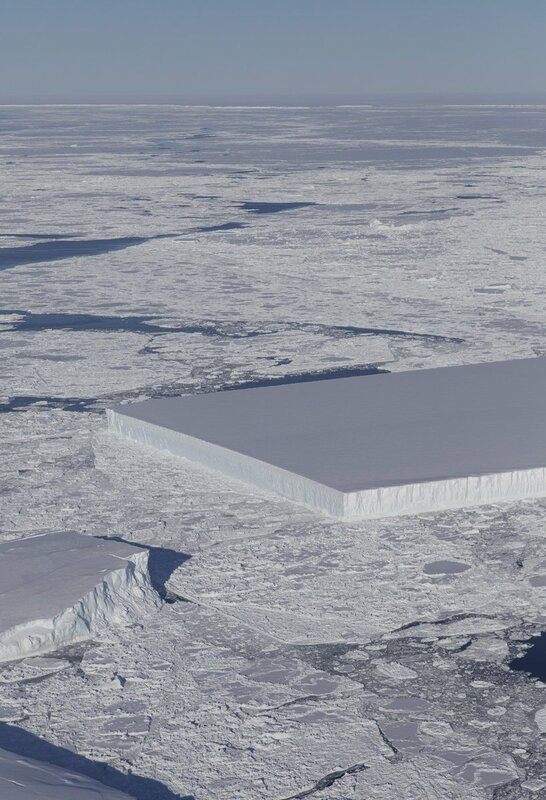 In an interview with LiveScience, NASA ice scientist Kelly Brunt explained how the rectangle iceberg formed: "We get two types of icebergs: We get the type that everyone can envision in their head that sank the Titanic, and they look like prisms or triangles at the surface and you know they have a crazy subsurface. And then you have what is called 'tabular icebergs.'" The latter, she said, split off the edges of ice shelves in the same way a fingernail that grows too long ends up cracking off. This is why they have sharp edges. Brunt did acknowledge that this particular iceberg was a “bit unusual.” She estimated its size to be about a mile wide. The Larsen C ice shelf is currently being monitored closely by scientists as it is showing signs of disintegration. Last year, an iceberg the size of Delaware (named A-68) broke away, raising concerns the whole thing was on the verge of collapse—just like the Larsen A and B ice shelves before it. A-68 has mostly been floating about in the Weddell sea since it broke away, but recently scientists found it is making its way back to Antarctica. Mark Brandon from the Open University in London, who studies the iceberg, said it is currently rotating and if it continues along its current course, its northern edge will collide with Larsen C. “It has a spectacular amount of momentum, and it's not going to be stopped easily,” he wrote in a blog post.